Africa hockey club Champions Orange Telkom played to 3-3 draw against Ghana Police in the ongoing Africa Cup of club Hockey championship at the Olympic centre Stadium in Lusaka, Zambia on Sunday. On form international Jackline Mwangi Jow scored a hat trick for the defending champions. 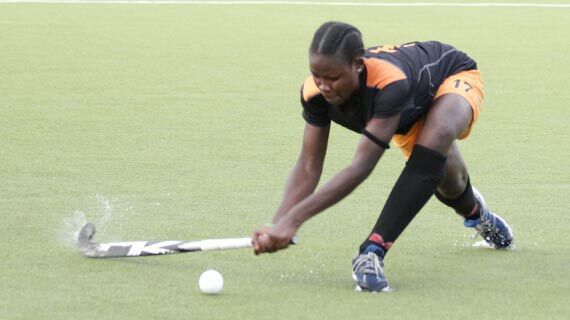 Mwangi who has been on roll on goal hunting mission and currently is the top scorer with 18 goals in the Kenya Hockey Union (KHU) national women's league, scored a superb field goal barely four minutes into play. Police equalized in the 13 minute through Mather Sarfoa with a fantastic field goal. Mwangi returned to haunt the Eric Obaya coached side in the 19 minute through a penalty corner, as Nafisatu Umaru ensured her name was on score sheet when she sounded the boards in the 27th minute through a penalty corner to level scores. Mwangi was again on target in the 34th minute with a field goal to put the national champions in the lead going into the breather. On resumption, Aggrey Faustina scored for the West Africans in the 55th minute through a penalty corner to level the scores 3-3. Orange will rest on Monday and take on hosts Lusaka Sharks in their second match of the week long event on Tuesday. Other matches played at the same venue in the ladies category, hosts De Stars Zambia were humiliated 6-0 by visiting Ghana ladies, as Sharkia of Egypt overwhelmed neighbors Weatherhead of Uganda 9-2.